Definition at line 49 of file llfloaterlandmark.h. Definition at line 96 of file llfloaterlandmark.cpp. References LLAssetType::AT_LANDMARK, LLUICtrlFactory::buildFloater(), LLPanel::childSetAction(), LLPanel::childSetCommitCallback(), LLPanel::childSetVisible(), FALSE, findItemID(), LLPanel::getCtrlByNameAndType(), LLFolderView::getFilter(), LLInventoryPanel::getRootFolder(), LLUICtrlFactory::getTextBoxByName(), gUICtrlFactory, LLInventoryType::IT_LANDMARK, LLInventoryFilter::markDefault(), mImageAssetID, mInventoryPanel, mNoCopyLandmarkSelected, mResolutionLabel, mSavedFolderState, mSearchEdit, mTentativeLabel, onBtnClose(), onBtnDelete(), onBtnEdit(), onBtnNew(), onBtnNewFolder(), onBtnRename(), onSearchEdit(), onSelectionChange(), onShowFolders(), LLInventoryPanel::openDefaultFolderForType(), LLInventoryPanel::setAllowMultiSelect(), LLSaveFolderState::setApply(), LLFloater::setCanMinimize(), LLInventoryPanel::setFilterTypes(), LLSearchEditor::setSearchCallback(), LLInventoryPanel::setSelectCallback(), LLInventoryPanel::setSelection(), LLInventoryPanel::setShowFolderState(), LLInventoryFilter::SHOW_NON_EMPTY_FOLDERS, TAKE_FOCUS_NO, WIDGET_TYPE_INVENTORY_PANEL, and WIDGET_TYPE_SEARCH_EDITOR. Definition at line 158 of file llfloaterlandmark.cpp. Definition at line 258 of file llfloaterlandmark.cpp. References LLPermissions::allowCopyBy(), LLInventoryModel::collectDescendentsIf(), LLDynamicArray< Type, BlockSize >::count(), gAgent, LLAgent::getGroupID(), LLAgent::getID(), gInventory, i, LLInventoryModel::INCLUDE_TRASH, LLUUID::null, and S32. Definition at line 65 of file llfloaterlandmark.h. Definition at line 169 of file llfloaterlandmark.cpp. References ACCEPT_NO, ACCEPT_YES_SINGLE, LLPermissions::allowCopyBy(), LLPermissions::allowModifyBy(), LLPermissions::allowOperationBy(), DAD_LANDMARK, FALSE, gAgent, LLAgent::getID(), LLView::getName(), LLInventoryItem::getPermissions(), lldebugst, llendl, mImmediateFilterPermMask, PERM_COPY, PERM_MODIFY, PERM_TRANSFER, and TRUE. Definition at line 215 of file llfloaterlandmark.cpp. References FALSE, LLUICtrl::focusFirstItem(), gAgent, LLFolderView::getCurSelectedItem(), LLAgent::getInventoryRootID(), LLFolderView::getItemByID(), LLInventoryPanel::getRootFolder(), LLPanel::handleKeyHere(), LLUICtrl::hasFocus(), KEY_DOWN, KEY_RETURN, KEY_UP, MASK_NONE, mInventoryPanel, mSearchEdit, LLFolderView::scrollToShowSelection(), LLFolderView::setFocus(), LLFolderView::setSelection(), and TRUE. Definition at line 69 of file llfloaterlandmark.h. Definition at line 296 of file llfloaterlandmark.cpp. Definition at line 355 of file llfloaterlandmark.cpp. 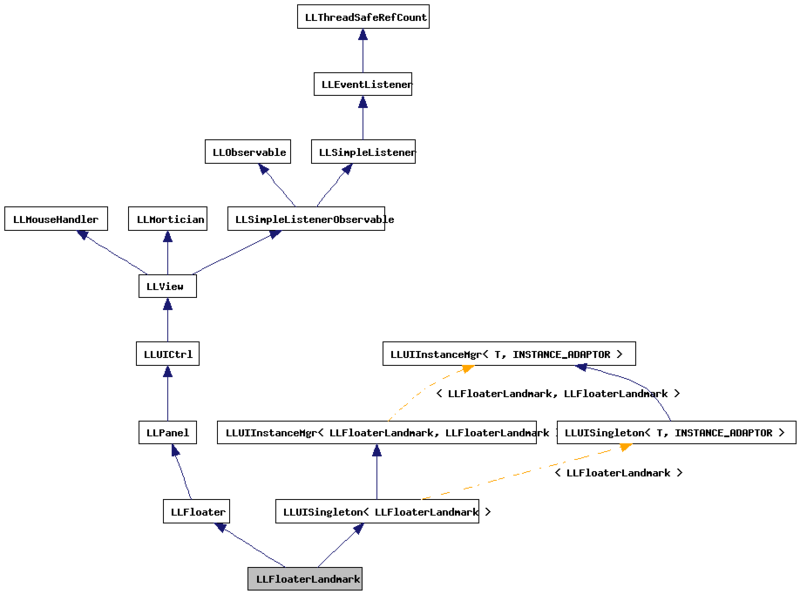 References LLInventoryModel::accountForUpdate(), LLAssetType::AT_TRASH, FALSE, LLInventoryModel::findCategoryUUIDForType(), LLInventoryModel::getItem(), LLInventoryObject::getParentUUID(), gInventory, LLInventoryModel::notifyObservers(), and LLInventoryModel::updateItem(). Definition at line 304 of file llfloaterlandmark.cpp. References LLInventoryModel::getItem(), LLInventoryObject::getName(), gInventory, open_landmark(), and TRUE. Definition at line 315 of file llfloaterlandmark.cpp. References LLViewerWindow::alertXml(), LLAssetType::AT_LANDMARK, LLAgent::buildLocationString(), create_inventory_item(), LLInventoryModel::findCategoryUUIDForType(), gAgent, LLViewerParcelMgr::getAgentParcel(), LLParcel::getAllowLandmark(), LLAgent::getID(), LLAgent::getRegion(), LLAgent::getSessionID(), gInventory, GP_LAND_ALLOW_LANDMARK, gParcelMgr, gViewerWindow, LLViewerParcelMgr::isParcelOwnedByAgent(), LLInventoryType::IT_LANDMARK, llendl, llwarns, NOT_WEARABLE, NULL, PERM_ALL, and LLTransactionID::tnull. Definition at line 350 of file llfloaterlandmark.cpp. Definition at line 394 of file llfloaterlandmark.cpp. Definition at line 251 of file llfloaterlandmark.cpp. Definition at line 436 of file llfloaterlandmark.cpp. References LLFolderViewFolder::applyFunctorRecursively(), FALSE, LLInventoryPanel::getFilterSubString(), LLInventoryPanel::getRootFolder(), LLFolderView::isFilterModified(), mInventoryPanel, mSavedFolderState, LLFolderView::scrollToShowSelection(), LLSaveFolderState::setApply(), LLInventoryPanel::setFilterSubString(), LLStringBase< char >::toUpper(), and TRUE. Definition at line 400 of file llfloaterlandmark.cpp. References LLPermissions::allowCopyBy(), FALSE, gAgent, LLAgent::getID(), LLInventoryModel::getItem(), LLInventoryItem::getPermissions(), LLInventoryObject::getUUID(), gInventory, and TRUE. Definition at line 421 of file llfloaterlandmark.cpp. References LLCheckBoxCtrl::get(), mInventoryPanel, LLInventoryPanel::setShowFolderState(), LLInventoryFilter::SHOW_NO_FOLDERS, and LLInventoryFilter::SHOW_NON_EMPTY_FOLDERS. Definition at line 163 of file llfloaterlandmark.cpp. Definition at line 68 of file llfloaterlandmark.h. Definition at line 96 of file llfloaterlandmark.h. Definition at line 103 of file llfloaterlandmark.h. Definition at line 85 of file llfloaterlandmark.h. Referenced by getAssetID(), and LLFloaterLandmark(). Definition at line 100 of file llfloaterlandmark.h. Definition at line 99 of file llfloaterlandmark.h. Referenced by handleKeyHere(), LLFloaterLandmark(), onSearchEdit(), and onShowFolders(). Definition at line 95 of file llfloaterlandmark.h. Referenced by isDirty(), and setDirty(). Definition at line 83 of file llfloaterlandmark.h. Definition at line 102 of file llfloaterlandmark.h. Definition at line 101 of file llfloaterlandmark.h. Definition at line 89 of file llfloaterlandmark.h. Definition at line 94 of file llfloaterlandmark.h. Definition at line 92 of file llfloaterlandmark.h. Definition at line 104 of file llfloaterlandmark.h. Referenced by LLFloaterLandmark(), onSearchEdit(), and ~LLFloaterLandmark(). Definition at line 98 of file llfloaterlandmark.h. Referenced by handleKeyHere(), and LLFloaterLandmark(). Definition at line 88 of file llfloaterlandmark.h. Definition at line 91 of file llfloaterlandmark.h. Definition at line 87 of file llfloaterlandmark.h.